Our most recent meeting, with our one female guest Ainsley Tuma. Jim Fox and grandson Zach! That's Richard Billingsly in the Background. This men's breakfast meeting began back in 2001 and was made possible by one of the first brothers that I met at Eagle Mountain, Don Pope. Don's desire was to have men of God gathering together for fellowship and strengthening each other in the word of God which included the breaking of bread, prayer and study. As time passed, Don left EMIC to pursue his ministry and asked me to take it over. 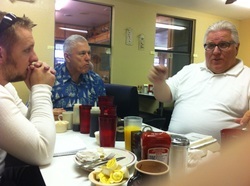 I accepted and held meetings until earlier this year when Tater Junction closed down. For over ten years now we sure enjoyed the Word of God spoken at these meetings. It had been a pleasure teaching these Mighty men of God, men who have come to know Him better and have come to these meetings with earnest expectations to feed on and spiritually digest God's Word. 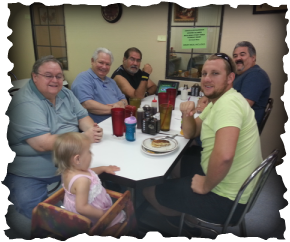 We thank God for all the men that walked through the portals there at Tater Junction. It has been a privilege to hang with such honorable and decent men. Men pure of heart. It was a time when many men were encouraged in the Word of God by Men whose first priority was that of seeking His Kingdom and His righteousness. The atmosphere at Tater Junction was heavy with the Presence and Glory of God. You can't help but feel the anointing as the Word of God is being spoken. It was an enlightening day in the Word. Jeff Swogger my spiritual brother from Ohio came down with a word of revelation that even exceeded my expectations. What an awesome start to a week totally immersed in the abundance of the Gospel. First here then with Dr. Nasir Siddiki and ending up at Kenneth Copeland's Ministers Conference at Eagle Mountain International Church. I can hardly wait to see what happens in the years to come. Amen! Recently, our time at Tater Junction came to an end as the restaurant closed down. We will definitely miss the times we had there, but we are eagerly looking forward to what God brings us in the near future. I profess that there will be another place for us to meet and fellowship with one another. In the meanwhile wherever we are, wherever we'll be should be a perfect meeting place for us to preach the gospel of Jesus Christ to all nations. Praise God!